There is something so grounded about real estate. Real estate has always been a standard investment product for wealthy investors. It is real, its value is apparent, and the supply of real estate is finite, making it generally a less volatile investment that should, over time, increase in value. At some point in an investor’s life, especially when a portfolio has grown to a size where investment concerns are not immediate in nature, they will possibly want to discuss real estate investing. There are many different ways to invest in real estate, and advisors should be aware of the constant fluctuations in real estate markets. Advisors do not need to be real estate brokers, but they should know someone in the industry who is trustworthy and can assist them with real estate investing advice. For the advisor, it is more important to know the valuation of an investor’s portfolio to know just how deep the investor can go into real estate purchases. At the same time, an advisor who is comfortable with real estate holdings and the potential growth of the market can certainly promote the idea of investing in residential, commercial or undeveloped land as well as the growing market of real estate investment trusts. 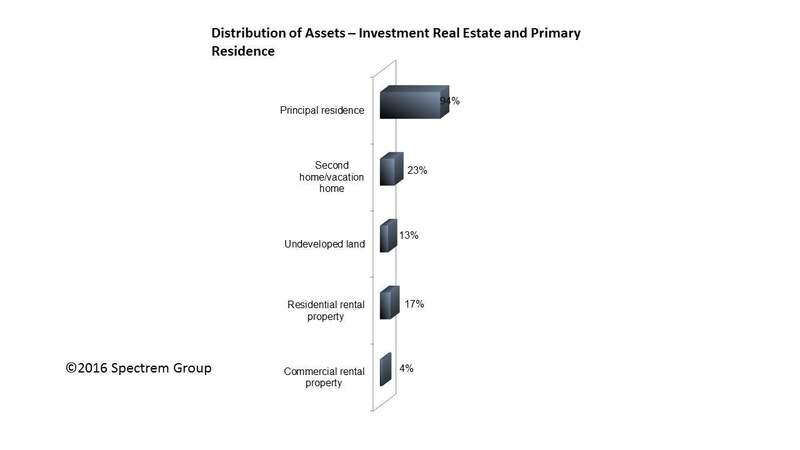 Most investors are already “invested’’ in real estate in the ownership of their principal residence. According to Spectrem’s ongoing wealth research, the principal residence of an Ultra High Net Worth investor, those with a net worth between $5 million and $25 million, is 8 percent of that investor’s assets. But, on average, the same UHNW investor has 7 percent of his or her assets in investable real estate. For investors with lower net worth, the value of their principal residence is a much larger portion of their overall assets, although the percentage of investable assets remains in the 6-7 percent of assets for all affluent investors. Furthermore, 25 percent of UHNW investors are invested in Real Estate Investment Trusts, while only 16 percent own undeveloped land and 20 percent own residential rental properties. An REIT is an industry-specific fund that must have 75 percent of its assets invested in real estate and 75 percent of its gross income derived from real estate. REITs are professionally managed. The information investors will want to hear is that REITs must maintain dividend payout ratios of 90 percent, and investors can reinvest those dividends to compound that income over time. There are other forms of real estate ownership, although their value as an investment is questionable. For example, 16 percent of UHNW investors own a time share, and 6 percent own vacation club memberships. Second or vacation homes are another popular form of real estate ownership. Among Millionaire investors with a net worth between $1 million and $5 million, 29 percent own a second home, and the average value of those homes is $274,000, according to Spectrem research. There are also investor segments more interested in real estate than others. Business owners, who often own property beyond their own home in running their business, show the highest interest in real estate investment. Among UHNW investors, the younger segment showed the greatest interest in owning residential rental properties and undeveloped land. Real estate is tangible and that factor may make it more attractive to some investors. There are many different ways to approach real estate investing. REITs may satisfy an investor with a broad interest in real estate who does not want to own individual properties. Find a local real estate expert who is knowledgeable about both residential and commercial opportunities. Make sure your expert understands the local markets. Also, either on your own or through a real estate expert, gain familiarity with property management companies. Your clients may want to own an apartment building to build a long term income stream but may not want to deal with the individual leases or with broken appliances. Many limited partnerships specialize in real estate. Become familiar with opportunities for your clients. If you service Business Owners, discuss with them individually owning the property in which their business is located. Also be aware of other opportunities. Business Owners tend to be more interested in commercial real estate investment than those in other occupations.